BEIJING — China’s yuan fell further Wednesday, fueling concern about a possible “currency war” if other governments fight back with their own devaluations to compete in export markets. Shock waves from Tuesday’s 1.9 percent devaluation against the U.S. dollar, which was the yuan’s biggest change in a decade, spread through financial markets, causing stocks and Asian currencies to tumble. Beijing said the yuan’s decline was a one-time event and part of changes aimed at making the tightly controlled currency more market-oriented. But analysts said allowing market forces free rein could drive the yuan sharply lower. Those suggestions gained ammunition when the currency slid another 1.6 percent on Wednesday. “It is very possible that we could see a 10 to 15 percent drop in the exchange rate against the U.S. dollar in the next week or two,” said Duncan Innes-Ker of The Economist Intelligence Unit in a research note. Investors saw Beijing’s move as an effort to benefit its exporters but many economists rejected that view because global demand is weak. 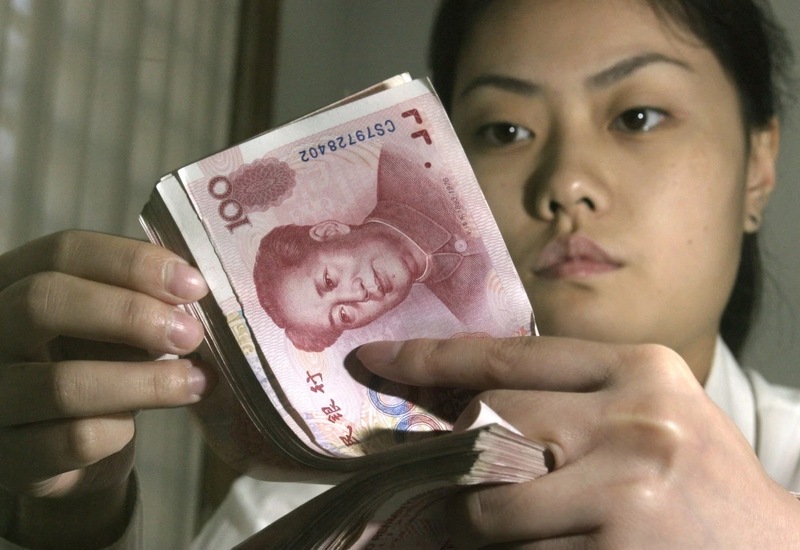 The yuan’s decline was small compared with fluctuations of freely traded currencies. But after a decade of little or no movement, the change rattled financial markets and threatened to fan political tensions with Europe and the United States. While the International Monetary Fund welcomed Beijing’s support for market forces, the change sparked complaints in Washington by lawmakers who accuse Beijing of manipulating its currency to gain a trade advantage. “This move may also trigger a new currency war” if central banks respond by trying to depress their country’s own exchange rates, said Nicholas Teo of CMC Markets in a report. Asian currencies declined as the lower yuan weighed on prices in markets where China is a major trader. Malaysia’s ringgit and the Indonesia rupiah plunged to their lowest levels in 17 years. The Singapore dollar, Taiwan dollar and Philippine peso fell to five-year lows. China is exporting “deflationary pressure,” said Morgan Stanley analysts Hans Redeker, Ian Stannard and Sheena Shah in a report. “This is not a marginal event, given China’s economic weight,” they said. Neighboring Vietnam announced it was widening the band in which its own currency, the dong, is allowed to fluctuate each day from 1 percent to 2 percent. That would allow the dong to depreciate faster, which prompted suggestions Vietnam might be trying to help its exporters compete with Chinese goods. Until now, Beijing set the yuan’s value each day based on a basket of currencies that is believed to be dominated by the U.S. dollar. That meant the yuan rose with the dollar over the past year, hurting Chinese exporters and raising the threat of politically dangerous job losses. Exports in July fell by an unexpectedly steep 8.3 percent from a year earlier. The yuan, also known as the renminbi, is allowed to fluctuate in a band 2 percent above or below a rate set by the People’s Bank of China based on its currency basket. The central bank said that starting Tuesday, the daily target will be based on the yuan’s closing the previous day and information from traders about currency supply and demand. Tuesday’s change probably was the “start of an engineered depreciation,” said Mizuho Bank in a report. China’s economic growth has slowed to an annual rate of just 7 percent, which is healthy for most countries but far below the previous decade’s double-digit pace. China becomes the third major trader to take actions that lower the value of its currency. Initiatives by Japan and the European Union over the past two years depressed the yen and euro by wider margins than this week’s decline in the yuan. Beijing’s move could complicate the U.S. Federal Reserve’s decision about when to raise interest rates that have been near zero since the 2008 global financial crisis. The Fed was expected to act later this year. A weaker yuan would reduce the price of Chinese goods, pushing down already-low U.S. inflation of 1.3 percent. The Fed wants to be “reasonably confident” inflation is returning to its 2 percent target before raising rates. The IMF said the latest change would have no effect on the decision about whether to add the yuan to the dollar, the euro, the yen and the British pound in the basket of currencies used to set the value of the Fund’s in-house currency, called Special Drawing Rights. The IMF staff recommended last week that China wait until at least October 2016 to join. The Fund’s board is due to consider that recommendation in October. “The more liberal approach to managing the exchange rate could bolster China’s claims that the renminbi is ‘freely usable,’ strengthening its case for inclusion in the IMF’s SDR currency basket,” said Innes-Kerr of the Economist Intelligence Unit.